Wheatgrass Benefits - Are There Any? More recently I've heard this watered down to wheatgrass possessing two or three times the nutrition value of other vegetables. An actual examination, however, shows wheatgrass is not radically more nutrient dense than other vegetables. In the chart below you can see how it compares to standard spinach. Like everything else in the plant kingdom, wheatgrass has nutritional strong points and weak points. A comparison to a dozen other fruits and vegetables would show there isn't a single nutritional element it provides that is not provided equally well by a balanced intake of fruits and vegetables. Wheatgrass Benefits - But What About Chlorophyll? 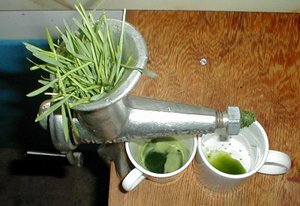 Do we need wheatgrass for the Chlorophyll? Chlorophyll is a substance found in plants that allows photosynthesis to occur. Life on this planet wouldn't be possible without it, as it is the way, directly or indirectly, that all creatures gather energy from the sun. Chlorophyll is also what turns plants green. Many argue chlorophyll, which is abundant in wheatgrass, is critical for human health, citing this as a reason to eat the grass. Whether or not chlorophyll is an essential nutrient is still a bone of contention among scientists, but it really doesn't matter if you're eating a healthy raw food diet, as all vegetables contain an abundance of it. An ounce of wheatgrass contains about 153.9 mg of chlorophyll (2), while the same amount of spinach contains 300 mg.
Wheatgrass Benefits - Can It Heal You? One of the persistent myths people accept is that food can heal the body, and that some foods are better at it than others. This flies in the face of everything we know about human life. There is no such thing as a healing food because only the human body can heal itself. Food has nothing to do with it. Detoxification, overcoming diseases, and healing wounds all occur at a rate the the body is able to sustain with its energy reserves. The best foods merely provide the high-quality building blocks the body needs to function while bringing in a minimal amount of toxins (which the body must expend energy dealing with). Whole, ripe, raw organic fruits and vegetables fit this description perfectly. Wheatgrass Benefits - A Food You Have To Juice? Next time you're hungry, go out and stare at some grass, imagining yourself biting into it - does it make you salivate? Of course not. Now, repeat that exercise in an orchard of ripe peaches. Imagine the scent of peaches reaching your nose. See yourself biting into one and feel the juices coursing through your mouth. Are you salivating? If you did a good job with your imagination, the juices probably flowed. Our mind knows what foods we are physically equipped to digest, and it will tell our body to respond accordingly. Although some people manage to choke down whole wheatgrass, they usually have to bury it among other textures and flavors. 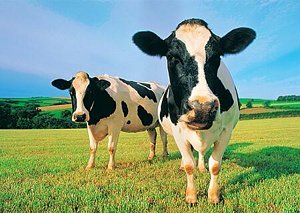 Put a cow out in a field of grass and and watch the saliva drip from its mouth - they obviously don't have our impediment. Cows and other rudiments produce cellulase and other digestive enzymes needed to break down cellulose (the woody fibers in many types of vegetation), but we don't. This means we can't digest a big part of wheatgrass. Any wheatgrass benefits we may have derived are questionable when we can't even digest the whole food. This usually leaves people to juice wheatgrass and sidestep the cellulose problem, but it's like bending over backwards to get a food that's nothing special. There are no magical wheatgrass benefits. It is not a superfood, juiced or whole, but merely vegetation which you can choke down. I believe the main reason for its popularity is, much like supplements, wheatgrass is very profitable. It costs almost nothing to grow, and after the hype people will pay an arm and a leg to get it. I don't believe anyone is going to kill themselves with wheatgrass, but I see no compelling reason to eat it in any form. Read about a healthy raw food diet that will outdo any wheatgrass benefits you may have derived. Learn about other foods you may have questions about. (1) Meyerowitz, Steve (April 1999). "Nutrition in Grass". Wheatgrass Nature's Finest Medicine: The Complete Guide to Using Grass Foods & Juices to Revitalize Your Health (6th ed.). Book Publishing Company. pp. 53. ISBN 1878736973. (2) Kohler, G. 1953. The unidentified vitamins of grass and alfalfa. Feedstuffs, August 8, 1953.